Wedding etiquette is changing all of the time, as any couple currently planning a wedding can attest to. 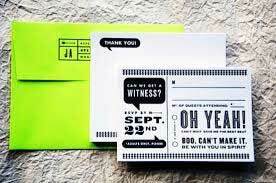 One of the areas that can be a little confusing is the wedding RSVP how your guests should respond to their invitation. The general rule of thumb when wedding invitations should be sent is eight weeks. Mail them any sooner and they may end up lost and forgotten in some of your guests' 'to do’ mail pile. Any later and you, yourself may not have enough time to track down those who fail to reply on time or make changes to your plans based on the final response rate. Yes, there really are people who do not know what RSVP actually means. Therefore make your wording a little clearer and more precise; 'please respond by' or ‘circle Yes or NO’ may be better alternatives and both are pretty clear! Some invited guests manage to get it into their heads that they only need to respond to your invitation if they will not be attending. Therefore make the response date as prominent as possible. If the date itself is lost in a sea of text it is more likely that some people will miss the point and assume that by their silence your crystal ball will tell you that why yes, they are attending. There are lots of people who haven't purchased a stamp in years let alone been anywhere near a post office, or even a mailbox, to send out their own mail. That is why, whatever the etiquette people say, it is best to offer an alternate means of response to snail mail. Offer the option of responding via email, or via your wedding website. It is not as exciting for you as opening up those reply cards but if it gets more people to actually respond then so be it.